"Fortune Teller" mentioned by name (and trade) on an 1854 handwritten debit entry, clipped from a larger sheet of unwatermarked "Lincoln blue" machine-made laid paper. The writing is scribbled, but appears to read: "1854 Mrrs. 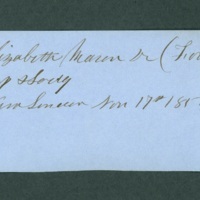 Elizabeth Maren Dr [i.e. Debtor] (Fortune Teller) / Nov. 17th to Lord & Lady $.50 / New London Nov. 17th 1854." Elizabeth Maren, “Fortune Teller debit entry,” The Skeptiseum, accessed April 25, 2019, http://www.skeptiseum.org/items/show/432.